RAD Server is not available to United States (US). 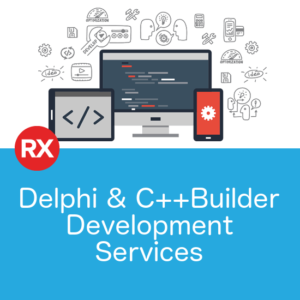 Before RAD Server, developers custom built back-end Delphi and C++Builder application servers using server toolkits like DataSnap which provided a few basic server building blocks for multi-tier, but left the vast majority of the development to the developer. Enter RAD Server. 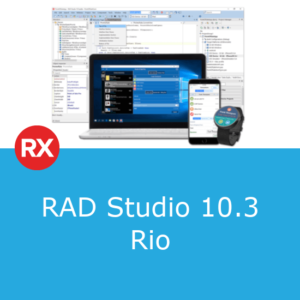 With RAD Server, developers can now simply load Delphi and C++ business logic methods into RAD Server, add some users, and go. REST/JSON end-points are auto-created and managed. 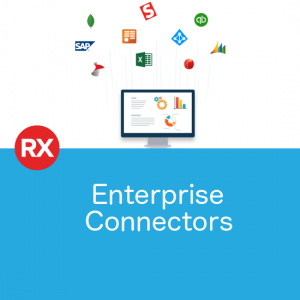 Data storage is built-in or you can easily connect to any popular Enterprise RDBMS or cloud service. Track and respond to user location. Integrate smart IoT devices into your solution. And deploy on site or in the cloud. Multi-tier has never been this simple, turn-key, flexible, and powerful. Not sure how to take your RAD Studio Application forward? Talk to our Delphi experts about your options. What’s the difference between a Single Client and Single Site license? 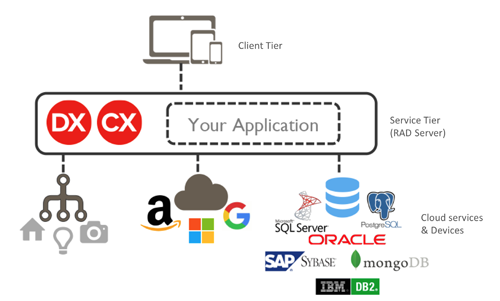 A Single Client license allows you to connect one device (mobile, tablet, PC, etc) to an instance of RAD Server. If you have a limited number of devices that need to connect, this is probably the most effective way to go. A Single Site license allows an unlimited number of devices to connect to RAD Server. If you’re deploying a public application, or have a large (or unknown) number of devices you need to service, a Single Site is probably the better option. Can I have non-RAD Studio applications connecting to RAD Server? 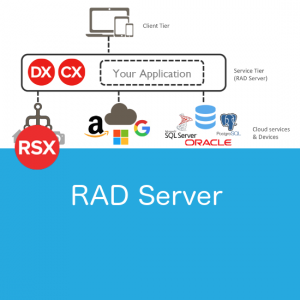 Can I deploy RAD Server to the Cloud? Yes. We’ve got customers using it in both Amazon Web Services and Microsoft Azure, in addition to in-house servers. Can my existing Delphi and C++Builder developers really build my cloud backend? Yes, that’s exactly what it was designed for: to be familair and easy for an existing RAD Studio developer to use. Watch the Foresiight video on the description tab if you’re not convinced.